Recently at the 2012 Sports Cards & Collectibles Expo in Toronto our partners at Grosnor Distribution hosted an event at the Toronto Raptors game where they brought in over twenty business partners who operate trading card shops in the area. It was a really great night where we were treated to a suite at the game and got to interact with these entrepreneurs who chased their dream of working in sports by opening a trading card shop of their own. That night I met the Chuck and Matt Durka who had recently opened Breakaway Sports Cards and Collectibles. They shared they had reviewed some of our previous stories on how to open up a trading card shop so I thought he would be a tremendous resource to provide information on just how they did it. We were able to have Matt answer some questions about how he was able to get his shop going and wanted to share the answers with those who have always dreamed of opening a trading card shop of their own. 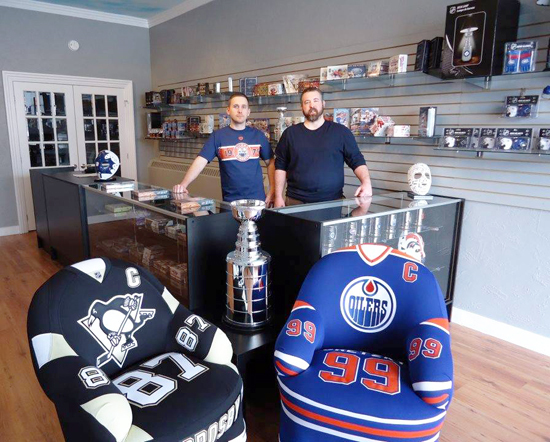 Brothers Chuck & Matt Durka made their dream of owning a hobby shop come true recently! But first, since they are a new shop, we want to encourage fans in the area to visit them and check out what they are doing online. Upper Deck: What made you want to open a trading card shop? Matt at Breakaway: I started collecting cards at a young age and always remembered how excited I was when I walked into a store. As I got older, I always thought about opening up my own hobby store. I always pictured myself behind the counter helping out my customers. The biggest reason why I wanted to open up a shop was because I am just incredibly passionate about the hobby. Over the years I saw many shops in my area close down and figured there was an opportunity because of the boom within the card industry in the past number of years. I went to college and university for business and Chuck owned and operated an online business for 5 years. We thought it was time to put our combined knowledge to good use and open up a shop in the industry that we both love. Upper Deck: What was the biggest challenge in turning your dream of running a trading card shop into a reality? Matt at Breakaway: The biggest challenge that we encountered would have to be the timing of the NHL lockout and contract negotiations. Being in Canada we are very dependent on hockey sales up here. We would have liked to open up the doors sooner, but thought it would be best to wait out the lockout. Knowing that the major focus of the store would be on the hockey side of things we had no idea what products were going to be released, which ones were going to be cancelled and whether or not the 2012-13 rookie class would be in any product after the lockout ended. Not knowing what products were going to be produced was a major issue to try and determine what sales would be like from now until the end of the year. Upper Deck: Having a solid business plan is very important. What are some tips you could give someone with regard to creating a business plan? Matt at Breakaway: We would certainly stress the importance of a well thought out business plan for anyone who decides to open up a store. Forecasting sales for a brand new business is very difficult to determine, especially since you have no history of any previous sales in past years. Making sure that you can control costs is key in the beginning. This will balance out some monetary issues during the start-up phase of the business. It never hurts to ask someone familiar with a business plan to guide you through the process. Make sure that you have enough money for your initial start-up costs and inventory. It makes no sense to fill your shop at the beginning before you have any idea of how many customers are going to be walking through your door on a daily basis. Try to see if there is a market for the hobby in your area which will help determine whether or not it makes sense to go through with the plan. Visit other shops, go to shows and talk to collectors in the area. Upper Deck: It takes capital to open a trading card shop. How did you secure financing and approximately how much do you think it takes to open a shop? Matt at Breakaway: Deciding to open up a shop did not happen overnight so we were able to put money aside well before we actually opened. We used a low interest credit card for inventory purchases to hopefully alleviate the amount of interest we pay in case product turnover is not very high at the beginning. All of the initial start-up costs like shelving, display cases, and an outside sign were all paid with cash to avoid any initial stress. Depending on the amount of inventory you would like in your store at the beginning I would have to say it probably costs somewhere in the neighborhood of fifteen to twenty thousand dollars to open up a shop. Upper Deck: Securing product and having inventory is very important for new shops. How did you go about getting inventory for the shop? Matt at Breakaway: Working with the authorized distributors and having a positive relationship with them definitely helped to have the right products when we first opened the doors. The good thing is that you don’t have to carry a huge amount of each item since most distributors offer next day delivery. Upper Deck: What types of events did you put together for the Grand Opening? 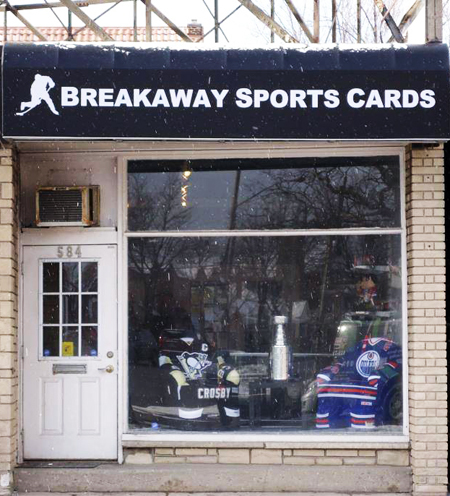 Matt at Breakaway: We were fortunate enough to open our store the same week that Upper Deck ran the National Hockey Card Day promotion. This definitely helped create some buzz within our local community to introduce a new hobby shop in to the market. 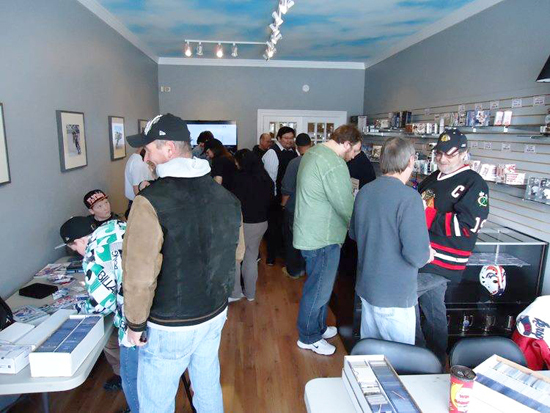 We held a few raffles for the customers that came in to the store on National Hockey Card Day and purchased enough Upper Deck product to meet the demand. 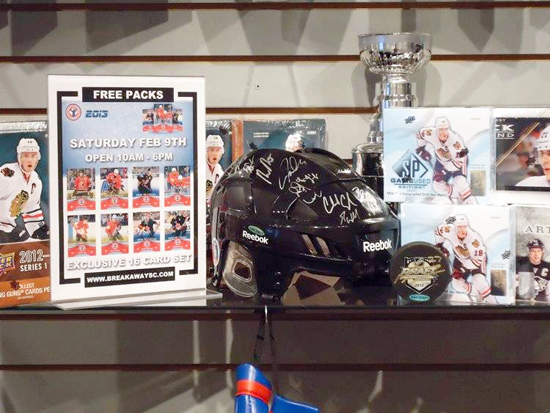 Breakaway Sports had a variety of high-quality giveaway items available to their collectors for National Hockey Card Day, including FREE packs! Our plan is to have an official Grand Opening celebration soon once we build up our clientele. This way more people will have the opportunity to win some fantastic prizes we plan on lining up for the Grand Opening store celebration. We are planning on always promoting new giveaways on a monthly basis to let my customers know that their business is definitely appreciated. I plan on holding events as well to raise money for some local charities that we support. 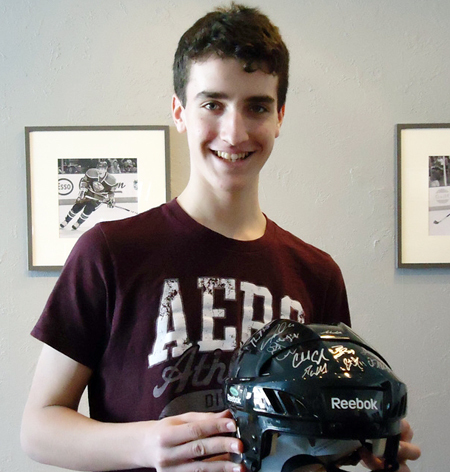 Giving back to thank their fans is quickly becoming an important way for Breakaway Sports to keep customers coming back! Upper Deck: How important are events like National Hockey Card Day for your business and how do you make the most of them? Matt at Breakaway: These events are extremely important for our business and we recommend that everyone that has a shop or is going to open a shop to take advantage of anything that the card companies do to help promote the industry. It is human nature for us to get excited when we have the opportunity to get a free pack of cards or win prizes. Utilizing the tools that the card companies provide will only help enhance your customer base and the overall business side of things. Your primary goal is to get people in to the store so they end up making a purchase and have such a good experience they want to tell their friends and come back. It only makes sense to take advantage of every single opportunity that is provided to promote your shop. Events like trade nights help pack the shop and provide collectors with a fun sense of unity. Upper Deck: If you could give someone one piece of advice who is thinking about opening a trading card shop, what would that be? Matt at Breakaway: I’m going to provide you with two pieces of advice because I think both are extremely important to help guide you to a successful business. The first would be customer service and I can not stress this enough. Most people that come in to a card shop are buying based on it being a hobby for them and they like to make a day of it. When they walk in to your store they always want to talk cards. Being open with them and having great conversations builds trust between the buyer and seller. It never hurts to take the time to learn about your customers on a personal level to better understand what they want and how you can help them. At the end of the day customer relations are retention are key. Give them a reason to keep coming back. This sounds simple enough, although it isn’t something that most small businesses practice unfortunately. The other piece of advice is to take advantage of any online tools like social media to get the word out there that you are in business. It is impossible to think that just by opening the doors people are going to walk through and start spending money. Twitter and Facebook are extremely popular and these tools should be utilized to their fullest potential. Having a website will also help promote your business. Also, participating in local card shows will also help get the word out there to the collectors in your area that you are open for business. It doesn’t cost very much to be at a show and most of the collectors go to these shows. This is a great time to promote your business and I recommend that you take full advantage of it. The information provided in this story is for assistance only and is not intended to be and must not be taken alone as the basis for an investment decision. Opening a trading card store, like any other business, presents certain risks for the business owner. Each reader of this information should make such investigations as it deems necessary to arrive at an independent evaluation of an investment.